Stray tweets are as common as stray bullets. So are unintentionally offensive Facebook posts. Sometimes we say things we just don’t mean. It seems a bit juvenile, but it happens when people make statements online without thinking about context or about how others perceive their words. Online presence is a key factor in modern business. An online presence that proves a company’s commitment to engaging consumers and improving their experiences optimizes business success. 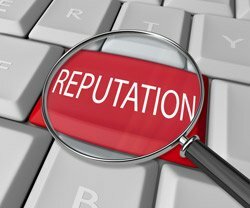 A part of having such an online presence is knowing how to build and maintain a clean online reputation. At the foundation of any business’ goals should be a desire to help consumers. Make that obvious in your online interactions. Always align web marketing with the company’s mission, values and business goals. Those elements of business should already be defined. Achieving a clean and positive online reputation is as simple as consistently presenting them in the dialogue with an online audience. 1. Avoid sensitive topics and religious/political references. This isn’t to discourage you to have an opinion. Thought leaders enjoy a large following because of the opinions they’ve shared that benefit others in some way. Just be careful with wording and any attempts to make jokes about subjects close to the heart. 2. Be a trustworthy source of industry news and interesting content. Personal experiences and insight on business topics work well to attract people with similar perspectives and experiences. But without building credit as a trustworthy source of news, those visitors who don’t agree with you may not stick around. People return to websites they trust for high quality entertainment or information. Focus on being that trustworthy, informative, up-to-date website at all times. Adapt the same priorities in social media as well. Make posts and content interesting, useful and relevant to your audience. Don’t spend too much time worrying about online reputation. Businesses with in-demand solutions and a quality web presence fare well with Internet users usually. If you’ve already made some mistakes with your online reputation, check out this article from PC World about cleaning up your online reputation.